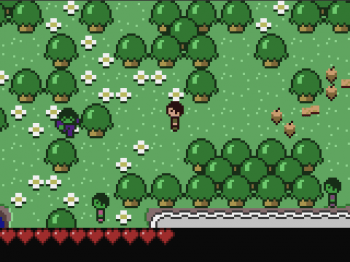 Notch, the maker of Minecraft, created a new game in under 48 hours: Minicraft. Minicraft is a top down, RPG like adventure game. It feels like a mix of Minecraft and the original Zelda. The game was created as an entry for Ludum Dare, a competition that asks game developers to make a game from scratch (that means coding too) about a theme that is provided by the community. This time the theme was alone, and if you have played Minecraft, you’ll know that this theme was perfect for him. Minicraft feels like one of those old RPG’s because you have a character on a journey to defeat the big bad, by defeating monsters and gaining better equipment along the way. It feels like Minecraft because there are no towns, no shops, and the monsters are basically just animals (and zombies, if that counts). Like in Minecraft, the monsters don’t drop better equipment, so you’ll have to punch it out of the country side. It starts to feel like an RPG again at that point, after you get the materials (by gathering, rather than fighting) you make objects that allow you to get stronger materials, which then in turn allows you get more materials… and so on, until you can reach the “Sky Wizard” and kill him. Even though it’s not quite as lonely as Minecraft, as you are just moving around your character like a puppet, having no towns, no shops, and no people make it the loneliest RPG I’ve ever played. If you play “All by Myself” by Eric Carmen while playing, it’ll enhance the experience.